Aeroflow Healthcare further supports Mission Children's Hospital by donating Valentine's Day gift bags and much needed winter items such as hats, gloves, mittens, blankets, and socks for patients and their families. Gift bag with card signed by Aeroflow Healthcare employees. The winter items from Aeroflow Healthcare will go to patients and families to make sure they stay warm this season. Aeroflow Healthcare donated Valentine’s Day gift bags for the patients at Mission Children’s Hospital. All gift bags contained a coloring book, crayons, stuffed animal, and Valentine’s Day card. “We want to show the children and families at Mission Hospital that we really care and want them to be included on the celebrations,” says Aeroflow Healthcare CEO Casey Hite. Aeroflow Healthcare is recognized as a premier provider of durable medical equipment (DME) and service in the Southeast, and continues to grow nationwide. Patients and physicians nationwide are choosing Aeroflow Healthcare as their provider for home oxygen, diagnostic sleep testing, CPAP equipment and supplies, nebulizers, mobility equipment, breast pumps, pediatric needs, catheters, negative pressure wound therapy and more; click here to see a full list of products and services. In addition to the Valentine’s Day gift bags, Aeroflow Healthcare also donated much needed winter items such as hats, gloves, mittens, blankets, and socks. The durable medical equipment company provided over 250 winter items for Mission’s Child Life Program. This program provides a sense of community and support for the children and families during and after hospitalization. The winter items from Aeroflow Healthcare will go to patients and families to make sure they stay warm this season. Aeroflow Healthcare is proud to partner with Mission Hospital to make sure the patients and families are provided with quality care for every moment of life. Over the past year, Aeroflow Healthcare raised over $6,100 and has donated clothing and toys for the foundation. For any questions about Aeroflow Healthcare’s donation and fundraising programs, or if you have interest in their services as a durable medical equipment supplier, you can reach them by calling (888) 345-1780 or visiting Aeroflowinc.com [http://www.aeroflowinc.com __title__ ]. 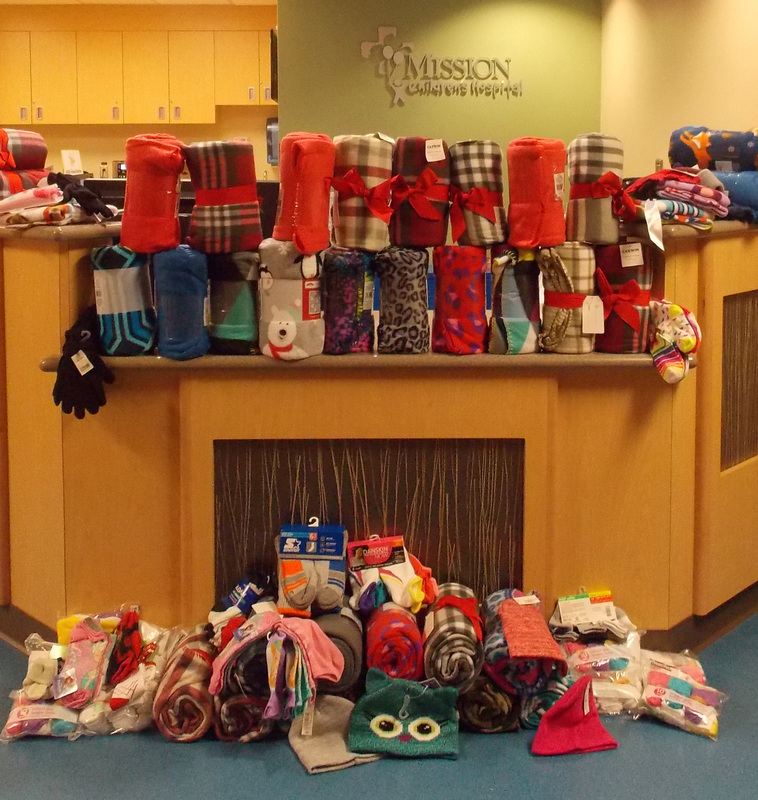 Winter hats, gloves, mittens, blankets, and socks donated to Mission Children's Hospital.